Apoptosis is a process of programmed cell death as a result of injury, immune reactions, aging, homeostasis, and defense mechanism. Necrosis acts opposite to apoptosis by inducing cell death that is not programmed and occurs in sudden or accidental situations. Conditions like anxiety and trauma cause changes in these two body processes that lead to many serious health issues like cancer due to imbalance in cell death and cell proliferation. Tumor necrosis factor related apoptosis-inducing ligand (TRAIL) is a death ligand protein that has a structure of C3-symmetry, zinc in the center with three monomer units. Tumor necrosis factor related apoptosis inducing ligand is a member of tumor necrotic factor family, the purpose of which is to promote apoptosis. Tumor necrosis factor related apoptosis inducing ligand binds with death receptor (DcR1 and DcR2) and form death-inducing signaling complex (DISC). In a recent research published in Bioorganic and Medicinal Chemistry journal, scientists in Tokyo University of Science led by Professor Shin Aoki constructed an iridium complex-peptide hybrid (IPH) that is so stable under physiological conditions, has similar structure and traits like of TRAIL, and possesses excellent photophysical and luminescence property. The researchers observed the luminescence efficiency of different iridium complex hybrids and found that they have IPH-6 had similar green emission property to that of their previous IPHs (IPH-4,5) (Masum, A.-A. et al., Bioinorg. Chem. Appl. 2018, ID 7578965). Effect of IPHs on cancer cell death was determined by MTT assay. It was found that TRAIL and the IPH influenced cell death up to 70 % and 55%, respectively. Flow cemetery measurements were also used to keep a check on cell death patterns. The IPH-6 was involved in the slow induction of apoptosis while IPH-4 does not cause apoptotic changes, although some mechanistic study suggested that both IPHs bind to DR5 and the difference between them is the position of the hydrophilic -CO-Gly-Ser-Gly-Ser-NH- linker. The researchers provided evidence that IPH-6 is considered as the first example that is a mimic of TRAIL and can cause apoptosis. TRAIL activity is proved to be a better approach than the antibody drugs in terms of convenient in handling and modification, bulk production and expense. The research work of Professor Aoki and his colleagues will help in the future in understanding and treating cancer in a better way. 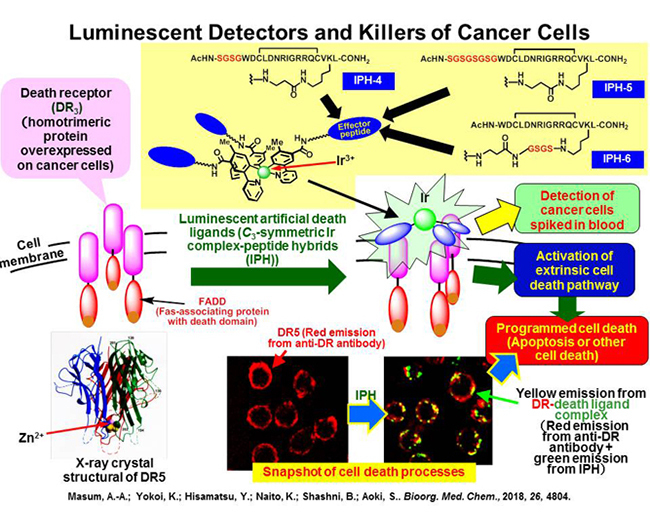 The team of researchers have provided results with evidence that luminescent IPHs as artificial death ligands, which afford snapshot images of cell death processes, can be used to find the mechanism of TRAIL-mediated apoptosis and cancer cell imaging. This advanced technique can be used in reducing the mortality rate in cancer patients by inducing the process of apoptosis in the cancer cells. Shin Aoki was born in Sapporo, Japan in 1964. He graduated from the University of Tokyo with B. S. (1986), M.S. (1988), and Ph.D. (1992) degrees in pharmaceutical sciences under the supervision of Prof. Kenji Koga. He started his academic carrier as an assistant professor at the University of Tokyo from 1990. Following postdoctoral positions with Professor Chi-Huey Wong at the Department of Chemistry, the Scripps Research Institute, USA, he joined Prof. Eiichi Kimura’s research group in 1995 at the Faculty of Medicine, Hiroshima University, where he became an associate professor in 2001. In 2003, he was promoted to a professor at the Faculty of Pharmaceutical Sciences, Tokyo University of Science and has been appointed as the Vice Dean of Research Institute for Science and Engineering, Tokyo University of Science since 2018. He is a recipient of the Award of Japan Society of Coordination Chemistry for Young Scientists (1999), the AJINOMOTO Award in Synthetic Organic Chemistry, Japan (2001), the Pharmaceutical Society of Japan Award for Young Scientists (2002), and so on. His major research interests are organic synthetic chemistry, bioinorganic chemistry, supramolecular chemistry, photochemistry, and medicinal chemistry, mainly using metal complexes in aqueous solution. Membership of Academic Societies: The American Chemical Society, American Society for Photobiology, The Pharmaceutical Society of Japan, The Chemical Society of Japan, The Society of Synthetic Organic Chemistry, Japan, Society of Coordination Chemistry (Japan), and so on. Masum A-A, Yokoi K, Hisamatsu Y, Naito K, Shashni B, Aoki S. 2018. Design and synthesis of a luminescent iridium complex-peptide hybrid (IPH) that detects cancer cells and induces their apoptosis. Bioorganic & medicinal chemistry. 26(17): 4804-4816.